Why, you ask? Well, Facebook reminded me that it was one year ago on March 26, 2015 that I wrote a blog about being “ Stuck ” and feeling all together depressed about my lack of progress in moving up the levels. In March last year, Ike and I were just not ready to test the waters of Second Level. So we continued showing First Level and schooling our collection at home. Later in the season we did finally test the waters at Second Level and earned scores anywhere from 59% up to 64%. Not bad, but nowhere near where we would need to be in order to make it to the regionals. So this winter we worked hard on the skills needed to up our Second Level scores. More throughness, more hind end engine, more collection, and more tactful riding. But I still wasn’t certain that it would be enough to compete successfully at the local licensed shows. Region 1 has A LOT of talented riders and freakishly talented horses with jaw dropping gaits. And they are very good at getting high scores on a consistent basis. So I had decided that if I couldn’t get mid-60 percentile at schooling shows, that I would not throw my money into any licensed shows. My dime would be better spent on more lessons. I only had two riders before Test 3, so we really just kept Ike relaxed and his focus away from the misbehaving horse being schooled in part of the warmup. My hope was to implement the judge’s suggestion for my medium trot and to maintain the dreaded canter serpentine without Ike thinking flying changes. Well one out of two isn’t bad. We had two very respectable medium trots, but our first serpentine was a hot mess. We fell out of our canter in the second loop of the serpentine. Poor Ike was fired up and even my quietest canter aid sent him to the moon with the wrong lead, a disunited canter and finally the correct lead. The horse breezing on the training track also gave us so much extra oomph for our second medium canter that I was not certain that I’d show any comeback. Can you say “unfortunate tension?” And sadly, our turn on the haunches were wrought with Frankenstein-like stiffness. Unfortunately, our mistakes were costly, so while I did manage to get a 6.5 and a 7 on our medium trots and a 7.5 on our transitions in and out of the medium trot, we ended up with a 58.659% due to our costly mishaps in our canter work. Tension is definitely not our friend. While I was hoping for two scores in the 60th percentile, I am okay with the outcome of the outing. Ike was a perfect gentleman on his first outing of the year at a very busy schooling show. He didn’t even react to the “flying horses” in the jump ring or the loose horse on the cross country course. Ms. C was very pleased with our work for the day and is working on a game plan to improve the low scores. We left the show with some new found confidence and the feeling that we are no longer “stuck” in the lower levels. Happy Spring Everyone! We look forward to seeing everyone this season! Hi friends, according to my mother, today is the first day of spring…Sure does not feel like it. The day started in the 30s with clouds and rain showers. Yes, she conned me into wearing this silly headband. She is sneaky that way. But she had black jellybeans so I caved. I had an inkling that spring and show season were getting close. Dad came and took my trailer away. Not sure where he takes it or why he takes it for a drive. Seems kind of silly to drive around without a horse on board. But he always brings it back along with snacks for me and my brother. Mom did her Edward Scissorhands routine on me mane, jawline, and legs. She let the bottom blade of the scissors rest on my neck, so she managed to cut the hair on my neck along with my mane. Oops. She will never win any grooming awards. She also has been milling around the trailer. She claims that it is spring cleaning, but I have my suspicions. Then there are the discussions between mom and Ms. C that I overheard the past month. They talk about tests, judges, and names of horses that I only see when I go places. So, yeah, it is definitely springtime. See you on the show circuit soon! 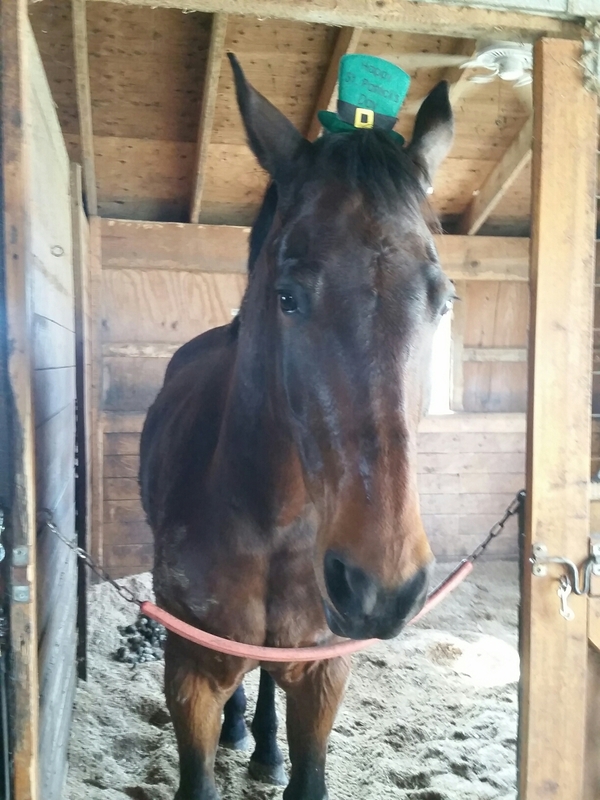 Ike wishes all his friends a very Happy St Patty’s Day…and asks that someone please intervene to stop this silliness with the embarrassing headbands. I had an epiphany the other day. No, it wasn’t about my riding skills or some huge life lesson. Nothing that profound or life changing. What I realized is that when the first words out of Ms. C’s mouth are “Your horse” or “Your horses,” the words that follow are usually not, “is an angel” or “are a pleasure to have around the barn.” No, the words that follow usually are more along the lines of, “ran me over” or “tried to kill me.” This must be what it feels like when a parent has a conference with their child’s teacher. “Your horse….is icky.” It is no secret that Cigar is a wee bit of a pig boy; he has been this way from the first day I owned him. He gleefully wallows in any puddle or mud slick and will try to bite me or run away when I attempt to remove the filth. Unfortunately for me, he has now lead Ike down the path of muddy ickiness. And I have discovered that if your unclipped horse sweats profusely on the abnormally warm day in March, the sweat combines with the winter’s worth of crud to create a sticky paste that doesn’t want to rinse off. You can create little spikes of hair to make your horse look like a punk rock band member. Since it won’t rinse away, the next time to see your horse, the hair is matted together and nearly impossible to brush. At this point all you can do is hope that it rains and that your horse stands out in the downpour for a few hours. “Your horse….looks like a plow horse.” I suppose that I must raise my hand and claim responsibility here although I’d like to think that Ike must bear some of the burden for this as well. We hear this when we are trudging around the ring on the forehand rather than engaging Ike’s rear end for more power. Sure, just half halt and all will be right in the world. Wrong. If I was a stronger person, a subtle half halt might do it, but on plow horse days, I sometimes have to resort to some louder tugging and a few jabs with my spurs to get the young man’s attention. (Yes, I heard you gasp in horror.) Once I fuss, Ike usually will comply and we can then move along more like the Second Level pair we aspire to be. And once Ike is engaged, it is amazing how much easier walk to canter transitions are and how much more of a push I can get for a medium trot. 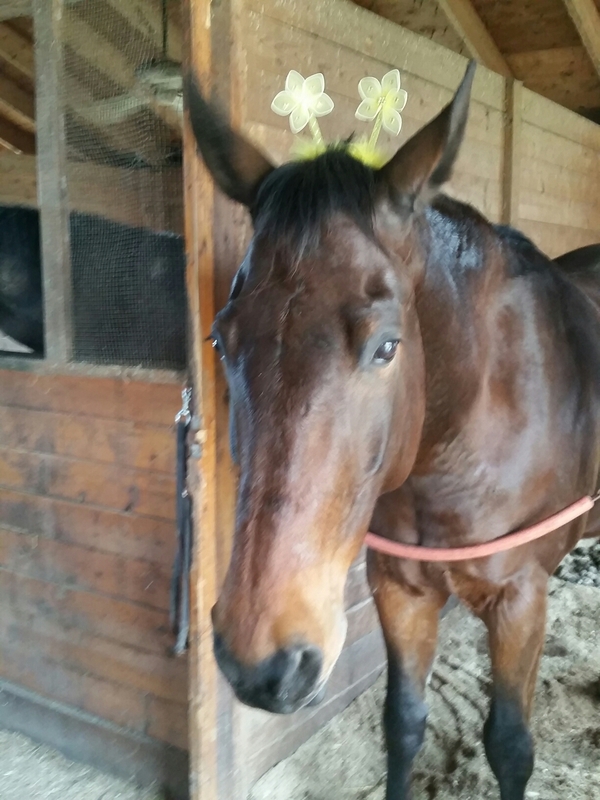 “Your horses….tore down the hot wire.” My boys are bound and determined to live together. They check the status of the hot wire on a daily basis. I can hear them asking each other, “Did someone forget to turn it on today?” Deconstruction commences as soon as they realize the power is off. I have reiterated to them that I do not agree with this course of action since I cannot afford to build a new wing onto Ms. C’s home for the vet to use. My admonitions seem to have little effect on their daily activities. “Your horse….looked like a rodeo bronco.” Thankfully, Ike rarely shows off his rodeo skills while under saddle. If you have followed us for a few years, you know that it did not end well for me the one and only time he bucked while I was astride…I showed off my gymnastic skills with a single front flip, but unfortunately I did not stick the landing. Routinely while stretching his legs in his paddock, Ike can be seen happily kicking up his hind legs. I cringe in horror as I play out the worst scenarios in my mind that involve strained muscles, torn ligaments and fractured bones. Any attempts to explain to him why this is not appropriate behavior fall on deaf ears. “Your horse…is very tall.” I usually hear this either after Ike has spent the day rearing while playing with his brother or after Ms. C has ridden him. I suppose that I am now so accustomed to his burgeoning girth that I no longer give it much thought, except when it is time to replace tack since most standard items won’t fit. Not everyone carries 18 inch browbands or blankets for big and tall boys; this reminds me of when my mother would shop for my brother in the “husky” boy’s section at Sears…clothing with a little something extra. “Your horse….is crooked.” Yet another time that I must share some, if not all, of the blame. It is most noticeable with our right lead canter. I know all about positioning my horse in a slight shoulder fore position, but just because I know about it doesn’t mean that I can tell if I have achieved the correct position. Usually we fail and Ike carries his hind end to the inside as we canter down the long side of the arena. Any judge who is paying attention will comment, “haunches in down long side,” but I am usually so focused on maintaining the correct rein length and praying that I can slow down the freight train at the appropriate point that I cannot spare a thought on where Ike’s haunches are. We are diligently working on it in our lessons. In my defense it is hard to know what is going on behind me when there is so much of it back there. My horses might be a handful, but they are mine. They make me laugh and smile and bring joy to my life. I hope your horses do the same for you.